However, there were a few things that I couldn't bear to sentence to basement-storage purgatory. My classics, for example, like jeans, a chambray shirt, and a jean jacket made the cut. As did this leopard blouse, because although it is long-sleeved, it's very light and won't add any bulk. I made it feel like spring by adding my favorite turquoise pencil skirt and gold wedge sandals. How are you transitioning your clothes for spring? We'd love for you to link up a spring look below! Be sure to link back to Anne and I in your post. 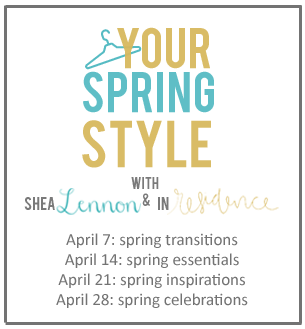 Join us next week to share a few spring style essentials and how you wear them. Light layers are the BEST. I feel like spring and fall are easiest to look put-together because there's just something about light layers. And I love the add of the pop of color for your leopard blouse... which reminds me I had actually put mine away for winter (too cold to wear it!) but it'll be perfect for now. I agree, and maybe that's why I like those seasons the best. And as much as I would love to have a huge closet large enough to hold all of my clothes at once, there's something to be said for pulling out something you put away for a season. It's like getting a "new" piece! So true! Another benefit I've reaped from the capsule experiment for sure. I love this outfit. Leopard and turquoise are one of my favorite pairings (after wine and cheese). You look beautiful! Thank you, you're too sweet! :) And I totally agree about wine and cheese, that IS the best. I really love that skirt! It is super cute! Oh this is so pretty. I love that skirt and it's proved itself to be such a versatile piece. I think your leopard print blouse is perfect for multiple seasons! I love the way it looks with your turquoise skirt! Thanks Megan! It really has been super versatile, which makes me happy because I love the color! Thanks Beth! I'm so glad I picked it up last season, it really does go with so many things! Super cute blouse, lady! Love it on you! Yay for April birthdays! Love your new capsule, I'm so excited for spring and bare legs and in my case - at least for the rest of April - light sweaters. Thanks Lydia!! Yay for April birthdays indeed! :) Light sweaters are better than heavy sweaters, but I hope you get some real spring weather soon!! I love the print on the blouse - so pretty! Thanks for hosting such a fun link up idea! Thanks Elle, and you're welcome for yesterday. I thought it was such a beautifully written post. Hang in there, friend. Love the pencil skirt especially! Teal/turquoise is one of those colors that I think transitions really well between spring and autumn...though maybe in combination with slightly different pieces each season. Thank you! I agree about turquoise transitioning really well--it's one of my favorite colors (I painted my walls turquoise in my living room!) so I'm happy that I can wear it year-round. Love this chic, work-ready outfit. Great teal skirt and such a cute top. Both posts I linked up talk about Spring Transitions. Hope you don\t mind there are two.